Ecuyer: Amateur gastronome who does not own a turning spit. Silver medal and chain on a purple ribbon. Chevalier/Dame: Amateur gastronome (male) who owns a turning spit. 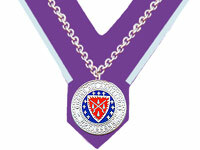 Silver medal and chain on a blue-bordered purple ribbon. Dame de la Chaîne Amateur gastronome (female) who owns a turning spit. Officier: Amateur gastronome promoted from Chevalier or Dame de la Chaîne for contributions to a Bailliage; must have attained a minimum of five (5) years’ membership (or two (2) years if a Bailliage Board Member) since induction, or (b) upon direct application to the Bailli Délégué (without Bailli recommendation required) for approval, having obtained ten (10) years’ of continous membership since induction. Gold medal and chain on red-bordered purple ribbon. Pair: An outstanding member of the Chaîne, promoted to this rank for unique service to the National Society; awarded by the Board of Directors only. Gold medal and chain on an orange-bordered purple ribbon. Rôtisseur: Young professional who works with a turning spit. Silver medal and chain; no ribbon. Grillardin: Young professional who works with a grill. Silver medal and chain; no ribbon. Chef Grillardin: Chef directing a kitchen that does not have a turning spit, but does have a grill. 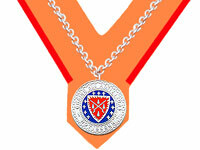 Silver medal and chain on an orange ribbon with the Grillardin escutcheon. Officier Chef Grillardin: Promotion from Chef Grillardin after ten (10) years of membership and outstanding service to his Bailliage. 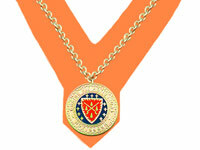 Gold medal and chain on an orange ribbon with the Grillardin escutcheon. Chef Rôtisseur: Executive Chef directing a kitchen where meats or poultry are prepared on a turning spit. Silver medal and chain on an orange ribbon with the Rôtisseurs escutcheon. Officier Chef Rôtisseur: Promotion from Chef Rôtisseur after ten (10) years of membership and outstanding service to his Bailliage. Gold medal and chain on an orange ribbon with the Rôtisseurs escutcheon. Maître de la Table: Restaurant manager or proprietor who does not himself direct the culinary operations of the establishment. 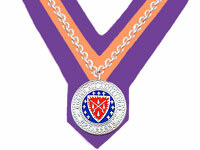 Silver medal and chain on a purple ribbon with an orange central band, light blue border. Maître Hotelier: Hotel manager or proprietor who does not himself direct the culinary operations of the establishment. 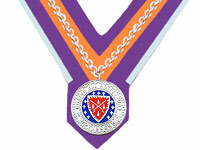 Silver medal and chain on a purple ribbon with an orange central band, light blue border. Maître Grillardin: Restaurant or hotel manager or proprietor, who does not have a revolving spit, but does have a grill. Silver medal and chain on a red-bordered orange ribbon with the Grillardin escutcheon. Maître Rôtisseur: Restaurant or hotel manager or proprietor who has a turning spit. Silver medal and chain on a red-bordered orange ribbon with the Rôtisseurs escutcheon. Professionnel du Vin: A person directly involved in viticulture, producing wine or spirits, or the sale and distribution of such products. Silver medal and chain on a purple ribbon with an orange central band with grape escutcheon. Professsionnel de la Table: A person directly involved in the growing or raising of culinary items or in the sale or distribution of such products. 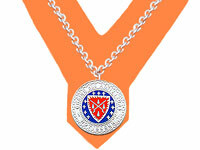 Silver medal and chain on a purple ribbon with an orange central band with cornucopia escutcheon. Officier Maître de la Table: Promotion of a Maître de Table for his/her active participation in the development of the Chaîne. Must have attained at least ten (10) years of membership since induction. Gold medal and chain on a red-bordered purple ribbon with an orange central band. Officier Maître Grillardin: Promotion of a Maître Grillardin for his/her active participation in the development of the Chaîne. Must have attained at least ten (10) years of membership since induction. Gold medal and chain on a red-bordered purple ribbon with the Grillardin escutcheon. Officier Maître Rôtisseur: Promotion of a Maître Rôtisseur for his/her active participation in the development of the Chaîne. Must have attained at least ten (10) years of membership since induction. Gold medal and chain on a red-bordered purple ribbon with the Rôtisseurs escutcheon. Grand Maître Officier: Title awarded to deserving Member holding the grade of Maître Officier for at least ten (10) years. The award can also be bestowed at the end of a career of a professional who has performed outstanding service to the profession and to the Chaîne. Awarded by the Board of Directors only. Gold medal and chain on an orange-bordered violet ribbon with the professional escutcheon. Regional Bailli: Chapter President, President of a Chapter. Gold medal and chain on a green ribbon. Vice Chancelier-Argentier: In charge of administration, treasurer and assistant to the Bailli. Gold medal and chain on a blue ribbon. Conseiller Gastronomique: Responsible for the planning of the menu, the choice of wines and and coordinating Bailliage events. Must be a Non-Professional. Gold medal and chain on a blue ribbon. Conseiller Culinaire: In charge of the realization of dinners and relations with Professional Members. Must be a Professional. Gold medal and chain on a blue ribbon. Chargé de Mission: Professional or Non-Professional in charge of special functions or assignments as may be delegated by the Bailli from time to time. Gold medal and chain on a blue ribbon. Chargé de Presse: In charge of public relations and the communication of Bailliage events to Society publications and communicates with the Regional Chargés de Presse. Gold medal and chain on a blue ribbon. Ordre Mondial. Gold medal and chain on a blue ribbon. Honorary titles are awarded for the following reasons: retiring in grade or being promoted to an honorary position due to service to the Chaîne. At the discretion of the Board of Directors of a local Bailliage, any retiring Officer may apply to retain his/her ribbon and be designated in rank as Bailli Honoraire, Vice Chancelier-Argentier Honoraire et cetera. In addition, the honorary titles listed below may be granted for outstanding service to the organization. Membre du Conseil d’Honneur: Awarded by the International Society for high service on an international level to the Confrérie. Gold medal and chain on a gold-bordered red ribbon. Chevalier d’Honneur: An honorary title which can be given to an important personality, political figure or diplomat; awarded by the Bailli Délégué. Gold medal and chain on a burgundy ribbon. Maître d’Honneur: An honorary title which can be given to an important food or beverage professional; awarded by the Bailli Délégué. Gold medal and chain on a burgundy ribbon.